The YEP’s dream target of achieving £3m for two of Leeds’s most vital end-of-life care services is within a mere fraction of becoming a reality thanks to a campaign spanning more than three decades. Launched in 1982, our Half and Half Appeal raises funds for two Leeds hospices – Moortown-based St Gemma’s and Sue Ryder Wheatfields, in Headingley. The paper set an objective of £3m in 2014 - and as of this week the pot has reached £2,994,127.05, meaning just over £5,000 - less than one per cent of the target - is needed. Tara Bean, interim head of supporter engagement at St Gemma’s, said: “We are incredibly grateful to the YEP and all it’s amazing readers who have supported the Half and Half Appeal. 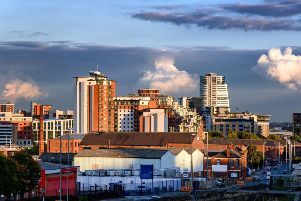 St Gemma’s is so lucky to have the support of the local Leeds community, as without this we would not be able to care for local patients, and their families and friends during this challenging time in their lives. The YEP’s Half and Half Appeal began in June 1982 with the aim of raising £250,000 to share between Leeds’s two hospices. As soon as the Half and Half Appeal launched, the people of Leeds and beyond rallied to donate as much as they could. Within two years, the original target of £250,000 had been reached. Donations passed the £1m milestone in 1990 and £2m by 2003. In 2014, the YEP launched a bid to top £3m. YEP editor Hannah Thaxter urged readers to “dig deep” and help us reach the final target.